Background and Objectives: The aim of present research work was to develop and validate a discriminative dissolution method in order to quantify simvastatin (SIM) in various pharmaceutical preparations using High-Performance Liquid Chromatography (HPLC) and ultraviolet spectrophotometry (UV). Methods: The dissolution test was performed according to standard procedures by varying the concentration of Sodium Dodecyl Sulphate (SDS) in dissolution medium (pH 7.0 sodium phosphate buffer) in order to discriminate the impact of surfactant on dissolution rate enhancement of drug in various formulations. The aforementioned dissolution method was validated for linearity, specificity, accuracy, precision and robustness as per the ICH guidelines using HPLC and UV method. Results of dissolution test were analysed by HPLC and UV and statistically compared (P≤ 0.05) to select the best method for estimation of simvastatin in various formulations in developed medium. Results: 0.1 % SDS in dissolution medium was optimized as this concentration was able to display the actual effect of formulation on dissolution rate of drug. All results of validation parameters of developed dissolution medium were found to be satisfactory and in acceptable range for both analytical methods. Linearity was found to be 4 -60 µg/mL and 2 -16 µg/ml for HPLC and UV methods, respectively. The low value of RSD (<2%) in both cases indicates that both the methods are adequate. Statistically, no significant difference (P ≤ 0.05) was observed between the two. Conclusion: Discriminative dissolution method for the quantification of simvastatin was developed and validated successfully. 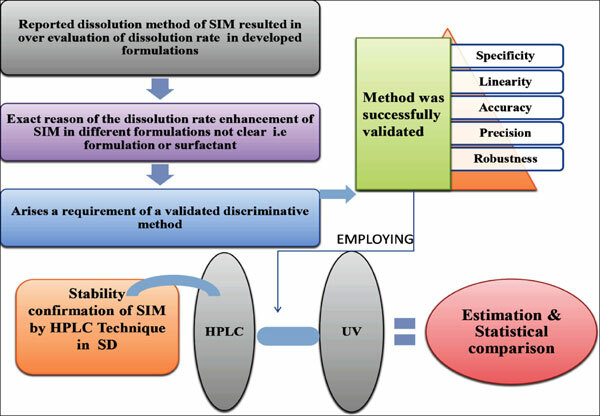 The validated dissolution method may be employed for quality control and estimation of SIM in brand new formulations. Keywords: Simvastatin, validation, discriminative method, dissolution testing, sodium dodecyl sulphate, dissolution medium. Keywords:Simvastatin, validation, discriminative method, dissolution testing, sodium dodecyl sulphate, dissolution medium. Abstract:Background and Objectives: The aim of present research work was to develop and validate a discriminative dissolution method in order to quantify simvastatin (SIM) in various pharmaceutical preparations using High-Performance Liquid Chromatography (HPLC) and ultraviolet spectrophotometry (UV).